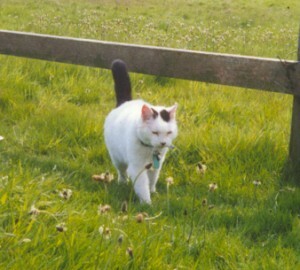 Our mascot Barney passed away in February 2006. We miss him greatly but he lives on in our memories and in the work we do. I have left his story, which was written about a year before his death, online so people can know about a cat who meant so much to us all. He is a prime example of the work we do, and he certainly made the effort worthwhile! 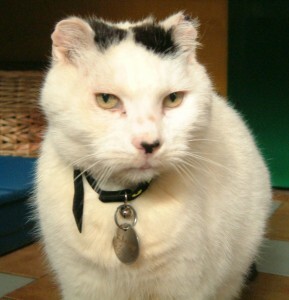 Barney was one of the first cats we took in when we moved into the RSPCA shelter in Oldham. He had been found by a lady in her garden and was not in good condition. He had little fur, his skin was red-raw and covered in scabs, he was thin and listless. The cause of his skin problems was a severe flea allergy that had gone untreated, he seemed to have been a stray for a long, long time. Because we never have any ill animal put to sleep that has a chance of recovery, we were determined to nurse Barney back to health. It took a lot of time, money and TLC but the sad little cat got better. His skin became healthy, his fur grew back, he put on weight and came out of his shell to show us he was a wonderfully affectionate cat with a lot of character. 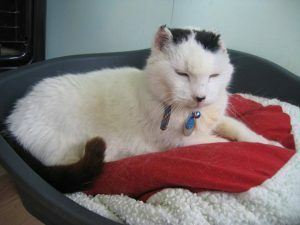 During his recovery Barney had become our first resident, he had the run of the building and slept in the staff room. We estimated he was about 7 years old and had lived for many of these years as a stray and would find it difficult to settle in a home. Added to this problem was the fact that he would need costly medication and veterinary treatment for the rest of his life. Few people would be willing to take on a cat of his age, who required so much freedom and expense, so we kept him. Barney became our mascot because we had all fallen in love with him and because he represented what we stand for: every animal deserves the chance of a happy life. We could have given up on that ill little cat when he came to us, but we refused to. When we moved to our Middleton cattery Barney came too, and after a few weeks sulking in a cage (while he got used to his new ‘home’) he was allowed out. I think Barney thought he’d found his own heaven when he found the gardens and fields around the cattery where he could roam and sunbathe! He loves nothing more than to go wandering but always comes when called in at night. A couple of years ago Barney was diagnosed with skin cancer on his ears, sadly it is not uncommon in cats with white ears who have been outside in the sun a lot. While we’ve had Barney he’s always had sun-block on his ears before going out but the damage done in his years as a stray couldn’t be undone. To begin with our vet recommended we didn’t have his ear tips removed as this can cause the cancer to spread into the head, and if this happens there is nothing that can be done. However, in 2003 the cancer got worse and Barney had to have the operation. Thankfully all went well and he’s now recovered brilliantly. Now Barney must be around 14 years old, possibly more. He still requires treatment for a few medical conditions but all are kept under control. He’s starting to show his age, he goes out less and sleeps more but he’s still a happy and affectionate cat. I don’t think many of us expected him to be with us for as long as he has, especially when we remember the state he was in when we first saw him. He’s been with us now for so long we can’t imagine the place without him! As our first resident he represents everything we stand for, in that we give every cat the chance of a happy life, even if it will cost us a lot and we can never really rehome them. Even though he’s not in a house Barney is very happy, he has the freedom he’s used to, plenty of love and attention, shelter, a warm bed at night and all the food he can eat. Barney will always be remembered at Oldham Cats, and he’ll always show exactly why every cat deserves the chance of a happy life.